The sound of religious worship is as varied as the number of faith traditions around the world. A mournful chant, an ancient hymn, a barely audible mantra, and even the wail of an electric guitar will pierce the air in various houses of worship. 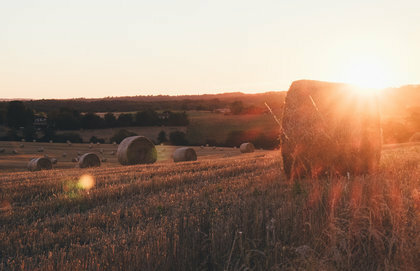 But on a sunny Wednesday morning, the typical sounds of worship gave way to the whine of circular saws, rumbling forklifts, and hammers hitting nails. 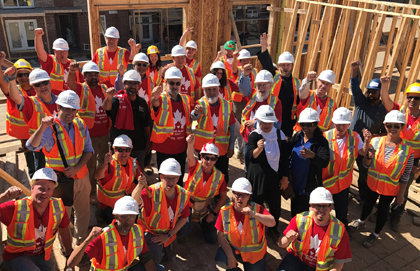 The audio landscape changed as more than two dozen leaders of faith communities and faith-based organizations responded to the call from Faith in Canada 150 to spend the day volunteering at a Habitat for Humanity Greater Toronto Area (GTA) construction site. “We believe that faith is what’s happening today – that faith is lived through action,” Ene Underwood, CEO of Habitat for Humanity GTA, told the multi-faith assembly at the faith leaders’ build. Her words came over lunch – halal, kosher, and vegetarian – while distinct faith communities mixed and mingled as they broke bread, taking a break from their construction. “Just remember, Jesus was a carpenter,” Rabbi Baruch Frydman-Kohl remarked with a smile at one point in the morning as he picked up tools with Christians, Muslims, and representatives of other faiths. It wasn’t long before he, Bishop Vincent Nguyen, and Imam Hamid Slimi were grabbing a plank of plywood together and nailing it down as part of a second storey floor. Differing backgrounds and beliefs did not get in the way of a common act of worship and a common expression of faith by contributing to the construction of 50 homes for low-income families. The significance of the day’s work wasn’t lost on Ray Pennings, co-founder and executive vice president of Cardus, the think tank behind Faith in Canada 150. They gave resonance to a simple truth: This is Canada. Faith matters. “Our political, philosophical, and theological differences exist, but we can find common ground using the hammer as an instrument of … God’s love and our common love and compassion for each other,” said Underwood, quoting Habitat founder Millard Fuller. And just how do so many faith leaders get together to work on a common project for a day? It wasn’t a spontaneous burst of cooperation. In fact, the day’s effort grew organically out of the Faith in Canada 150 project, which created a national network of faith leaders and faith-based organizations called the Faith Alliance. “The seed sort of got sown, if you will, at one of those Faith Alliance meetings,” said Pennings. It was at one of those meetings earlier in the year when several faith leaders broached the idea of cooperating at a Habitat build. And it wasn’t long before an event was organized and leaders were being recruited to take part. Faith leaders packed up their tools and gave back their hard hats at the end of the day. But they didn’t just help build homes. They gave resonance to a simple truth: This is Canada. Faith matters. Daniel Proussalidis is Director of Communications at Cardus.